Lateral epicondylitis, commonly known as ‘tennis elbow’ is a condition that causes pain around the outer area of the elbow. This condition occurs when the tendons are overloaded, usually due to repetitive motions of the wrist and arm, resulting in unbearable elbow pain. Tennis elbow can arise in any person who strains the tendons of their forearm and is a condition that is not limited only to tennis players. Anyone whose jobs require them to move frequently can also develop the condition. The pain of this condition occurs primarily where the tendons of the forearm muscles attach to the bony bump on the outer area of your elbow and can also spread into the forearm and the wrist. Therefore, an immediate treatment that involves a team approach of primary doctors, physical therapists and sometimes, surgeons is essential, to get the most efficient care. What are the Signs and Symptoms of a Tennis Elbow? Pain on the outer area of the upper forearm, just below the elbow. The pain may also travel towards the wrist. Pain when writing or gripping an object. For example, when holding a book or a pen. Pain when lifting or bending the arm. Pain when twisting the forearm. For example, when opening a jar or turning a door handle. Pain and stiffness when extending the arm. An episode of tennis elbow can last between six months to two years. However, most people recover completely within a year. What Causes a Tennis Elbow? Tennis elbow, in most cases, is an overuse injury and occurs when the tendons and muscles in the forearm are strained due to strenuous activities. If the tendons and muscles in the forearm are strained, inflammation and tiny tears can develop near the bony lump on the outer area of the elbow. You are likely to get a tennis elbow if your forearm muscles are not accustomed to performing a particular activity. However, even if you frequently use your forearms, there are chances that you might injure them, resulting in getting this condition. Throwing sports such as discus or javelin. Racquet sports like tennis, squash or badminton. Manual work such as bricklaying, plumbing or gardening. Certain activities that involve repetitive hand and wrist movements such as using the scissors or typing. Other activities that involve repetitive bending of the elbows such as playing the guitar or violin. How to Treat a Tennis Elbow? Tennis elbow is a condition that is self-limiting, which means that it will get better without treatment. This condition can last for several weeks or months, and sometimes, even years as the tendons heal slowly. Numerous treatments can help alleviate the pain for a tennis elbow. However, the most important thing you must do is rest your injured arm and stop performing strenuous activities. Among various tennis elbow treatments, physiotherapy has shown to be most effective in the short as well as long-term management of the condition. However, in extreme cases, surgery may be recommended if other treatments fail to work. How can Physical Therapy Help a Tennis Elbow? Reduction of the elbow pain. Faster facilitation of the tissue repair. Restoration of the normal muscle length, strength and the movement patterns. Restoration of the normal joint range of motion and function. Normalisation of the cervical joint function. There are numerous ways to achieve these, and getting a thorough check-up of your elbow, arm and neck will enable your physiotherapist to plan a strategy for you based on your symptoms and lifestyle. Physiotherapy for a tennis elbow treatment can include a gentle mobilisation of the elbow and neck joints, muscle stretches, neural mobilisation, electrotherapy, massage and strengthening. In severe cases, a tennis elbow brace may prove to beneficial. 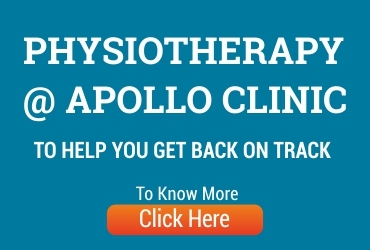 At Apollo Clinic, we offer you few of the best services for various conditions, one of them being a tennis elbow. With our team of physiotherapists who have excellent knowledge and tremendous experience in the field of physiotherapy, we aim at helping each one suffering from this condition. Having a team of few of the best physiotherapists in the country, we assure to help you tackle your tennis elbow with ease in the most positive way. We also promise to help you lead your life well without any fear of the condition.